Moonrise by Sarah Crossan is a heartbreaking story of life and death that reveals how death sentences affect prisoners and their families. Joe is a teenager who’s brother Ed has been sentenced to death. Joe travels from New York to Texas, where Ed is locked up, to visit with him before the execution takes place. Alone and with little money, Joe struggles to survive in a small town where he doesn’t have much to do between visits with his brother. Can he forgive him? Does he believe him when he says he isn’t guilty? Is there hope for redemption? Moonrise addresses all these questions and more. Crossan tells the story in verse. This cuts detail, which allows the characters and their emotions to shine. A unique way to tell a story, the plot moves quickly due to the bite sized poems, although occasionally, the format may distract the reader from the story itself. Moonrise shines in its well rounded characters. Switching between past and present, the reader glimpses how Joe and his siblings were raised. An alcoholic and distant mother, no father, and lack of resources, paint the picture of a family doing their best to get by. Joe, Ed, and their sister Angela, are a close knit trio who rely on each other when they have nothing else. Shortly after Ed leaves for good, he is arrested. In the present day story, ten years have passed since Joe has seen his brother, and he reflects on the events of his childhood realizing that his older siblings sheltered him from the difficulties of their lives. Ed is more than a brother to him, he’s also a father figure, and Joe grapples with this as the days countdown to Ed’s execution. Through Moonrise the reader gets to experience the pain and difficulties prisoners face while on death row, and how their families deal with their sentences. Crossan details the drawn out and complicated process of legal issues such as dealing with lawyers and appeals. While this allows the reader to feel the ups and downs of emotions as hope builds and breaks, in some places it slows the pacing of the story. Crossan writes a fascinating story from a perspective that many have never experienced. 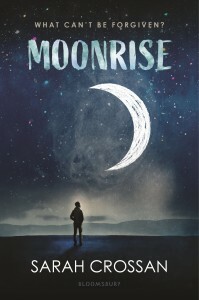 Moonrise is well written, bolstered by real and interesting characters, which make it all the more difficult to read as they deal with a unique, difficult, and sad issue that ripples throughout their family.